Alex was 15 and Vera 13 when war broke out in Europe. Before war was declared, Yugoslavia and Germany had signed a pact with one another as part of the Axis powers. Italy, Hungary and Bulgaria were also members. However, the Yugoslavian people--with the exception of the Croatians--rebelled against this pact; even the schoolchildren got involved in the protests. Yugoslavians in general and the Serbians specifically had always been anti-German. The country was 43% Serbian and 34% Croatian, which led to much ethnic tension. The anti-German sentiment prevailed, the pact was overthrown and Hitler declared he would punish the Serbs. So, everyone knew the punishment would come soon, but they didnt know when it would arrive at their doorstep. Belgrade was a city of 300,000, with only 11,000 Jews. When war came, the radio didnt give any advance warning; the Croatians, as collaborators, jammed the radio waves to help the Germans catch the Serbians unaware. As music was playing on the radio early one morning, the city alarms went off. 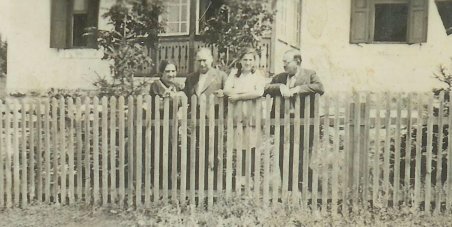 The Robichek family rushed down to the cellar with nothing but the clothes they were wearing (Vera had but her slippers on); at one point, Alex was curious and went up to see the German planes of the Luftwaffe flying overhead. Just after he came downstairs again, a bomb hit the apartment house and destroyed everything the family owned. This happened at the very beginning of the raid on Belgrade....barely five minutes after war was declared. The cellar was basically safe, although a couple of people were killed by falling items. The bombs were coming in five minute waves. On April 3, 1941, Belgrade had been declared an open city (i.e. defenseless and shouldnt be attacked), but in the end the Germans didnt honor the agreement. The family scrambled out and went to a nearby fallout shelter, but it was too crowded and they couldnt get in. So on they went, huddling in doorways when the planes came close, so close that they could see the pilots in the planes and vice versa. The German pilots were machine-gunning civilians down in the streets of Belgrade. Soon after a direct hit came on the shelter and everyone perished; the family later realized how truly lucky they had been and even though they had nothing left, they were alive and together as a family. On April 7, the Royal Government of Yugoslavia declared by proclamation the beginning of the war against Germany and Italy. By April 8, 12,000 people in Belgade had been killed in air raids and 672 buildings had been completely demolished, in addition to the thousands of other buildings which had damaged. On April 13, the Germans began their occupation. The family went to their cousins (David Hohner) house; they were a brother and sister, he a director of Vienna Bank, one of biggest in Yugoslavia and she a retired owner of a fancy fashion design shop. Prior to the war, they used to entertain lavishly. Adolf wanted Marianne and the children to stay here so that he could report for active duty (he was a reserve officer). This was one of the few times in her life that Marianne asserted herself; she refused to stay, not wanting to be a charity case with two kids living off of others. So they stayed together as a family and went with Adolf to find the military authorities. They were able to get car rides with people, as Adolf was well known in the area (no amount of money could commandeer a vehicle). They ended up in Split, 225 miles from Belgrade on the Adriatic coast. Normally a quick trip, it took them several days to reach the coast; they slept in the car or in ditches and everytime a bomb raid would come, theyd run for the ditches. At one point, they had stopped in a town where the Germans were looting; the driver of their truck decided to move on to the next town and, as luck would have it, the Germans took the first town and the Italians captured the one they went to. They arrived in Split to see the ship they were going to catch pull out into the Adriatic. The ship was filled with military and government personnel going to England and, with Adolfs connections, they would have been accommodated. As they watched it leave, the ship was bombed and sunk by the Germans. Meanwhile, in Belgrade, all Jews were required to register at the outset of the occupation. In July, there was a Serbian revolt and all Jewish males were placed in camps in and around Belgrade. Many were then murdered by the Germans. Then in March of 1942, facilities were brought in and women and children were gassed. This in effect marked the end of Serbian Jewry. In retrospect, many of the Jews who survived did so by escaping to the Italian zone of occupation on the Adriatic. The Italian government, military commanders and foreign ministry officials worked out a policy to protect the Jewish people from the Germans. The reasons for this policy were multifold; they opposed the murder of the Jews, they wanted to safeguard their prestige and standing in occupied Yugoslavia and they had the growing realization that the war was turning in favor of the Allies. Germany and their puppet Croatia pressured the Italians to turn over the Jews, to no avail. With that avenue closed, Adolf was resigned to returning to Belgrade to report for active duty. He met with a non-Jewish minister of parliament whom he knew in Split and was told by him not to leave. The man would go instead and send word back. At this juncture, the family didnt know how bad the treatment was to be for Jews during the war; they knew that the Jews werent being treated well, but certainly didnt know the extent of it. During this waiting period, Marianne discovered that the Yugoslavian government was paying all government employees three months salary prior to the Italians taking over, so Adolf was able to secure money in Split. The day before they were going to leave for Belgrade (having not received any information from the minister), they finally received word from him not to return. It turns out that one of the first 20 hostages shot by the Germans was Adolfs cousin, David Hohner, at whose home Marianne had refused to stay. So they remained in Split with the Serbians and the Montenegros. The Italians were afraid of the Montenegro region; the terrain there is such that no one could take over the area. But in Split, the Italians took 200 Serbs and Montenegrans as hostages (the Italians did not kill hostages--they just threatened to kill them). After being jailed for a week in Split, the entire group was taken by ship to Albania.